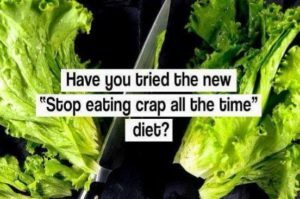 Many people ask me to recommend a diet that works the best. When I tell them what they need to eat, they express frustration: too expensive, too complicated, not enough time, etc., etc. Actually, yes I do. We have to make long term lifestyle changes. By doing what they are doing, they are breaking down their bodies and setting themselves up for future problems. And the financial and emotional expenditure to “fix” the problems they create will be enormous! We can all change some bad habits in order to improve our health. But that means we can choose to start this journey by taking one step in the right direction. We also get to make investments — investments of time, energy, and money. So let’s stop making excuses. Let’s take responsibility for our health, and gain more vigor and vitality while we reverse disease. And today is a good day to start! Thank you so much for your kind words, Diane. They encourage me, also.